Double denim is quite a controversial trend-you either love it or not. I'm willing to try it once, or more if it works! I purchased this Topshop Moto biker denim jacket from Cancer Research charity shop a couple of weeks ago for £3.99 and I'm wearing it with my grey Comme Des Garcons tee, which was £1 from the boot sale a few years ago. I'm also wearing my denim leggings from the local market last year, a few months before denim leggings, jeggings and treggings really became on trend!! How about trying double denim this season? You look great in this look but I'm still too nervous to try it out for myself. I like the jeans leggings! Looks great on you! It's a tricky look to pull off but you do it perfectly. Looks good on you, I think the key is to wear two different shades and that jacket is perfect. I used to wear DD a lot in my twenties but not so sure about it now..after seeing your pics though, I might just give it a whirl! It definitely goes well together with the boots and all. I have had a deninum coat with lots of pockets that goes to my knee since middle school. And I still love that coat which I found in the boys section so it goes along with me. still. I just found a dyi project of someone using Hanes briefs for a skirt. I'm sure my boyfriend would be upset if I raided his underwear drawer, but he has some of the plaid colors that were in that ruffled skirt. hey honey, im liking the denim double look. I'll try it if I have two different shades of denim. Adding this to my upcoming post! You make a strong point for double denim! Great combination and the stretchy jeans/jeggings look fabulous on you! 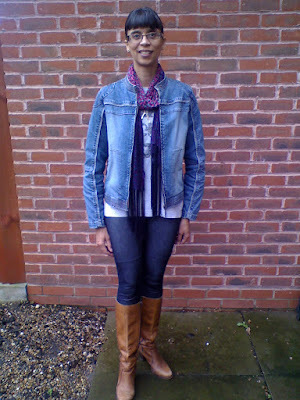 I have been sporting double denim but in different colors. Love the denim and denim! Hi everyone-thanks for all the lovely comments, pleased to hear some of you are trying the trend too!! HI- haven't been to your blog for some days now and I see you've changed the set-up. Cool - very spacious & airy. Like it. Also like your slide show - very inspiring. Many bloggers are doing new things to their blogs these days. Lots of technology out there to play with. Prosit! I've tried it and now I'm converted. Plus it's doubly comfy! I used to rock the double denim look when I was still in secondary school, but I don't think I'm ready for a revival yet ;-) I must say though, as dubious as I am of this trend re-emerging, I love your take on it! Great outfit and I really like that scarf! 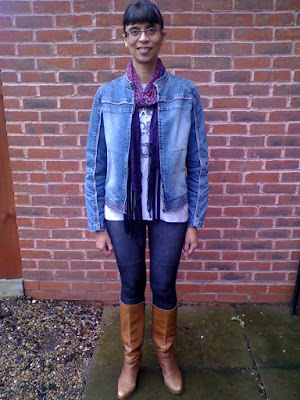 Hi ladies-thanks so much for the lovely comments and thoughts on double denim! !